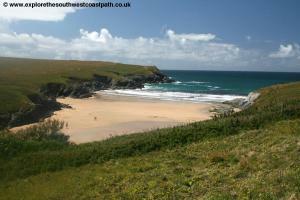 This is certainly a walk to save for a sunny day as it takes in some of North Cornwall's best beaches. 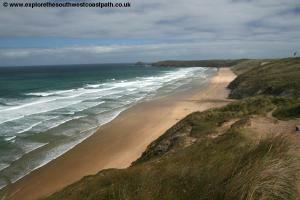 Beginning from Perranporth we follow the the golden sands of Perran Beach for almost 2 miles and after another mile or so arrive at Holywell Bay with it's massive dunes. The walk continues passing the more remote and beautiful Porth Joke and on to Crantock Beach, another lovely sandy beach. From here cross the river Gannel (this may require a lengthy diversion inland at high tide) to Pentire point and then the famous Fistral beach, continuing to the centre of the popular resort of Newquay. From the main A30 road exit onto the B3285 a couple of miles west of the A39 exit for Truro. At Goonhavern turn left onto the A3075 and take the next road on the right, still the B3285. 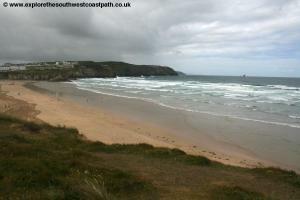 After a couple of miles you arrive at Perranporth. Follow the signs to the main car park at the western edge of the beach. This is a pay on entry car park. 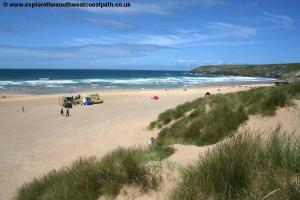 Perranporth is served by a regular bus service from Truro (on various routes). 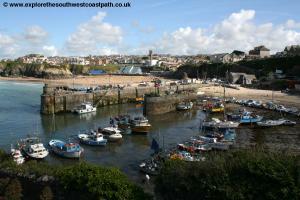 There are also hourly buses to Newquay. For details see the link below. 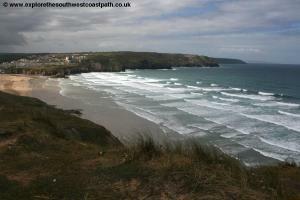 There is a good choice of accommodation in Perranporth and a huge choice in Newquay where the walk ends. There are choice for all budgets from camp sites to luxury Hotels. Follow the links below for more information. 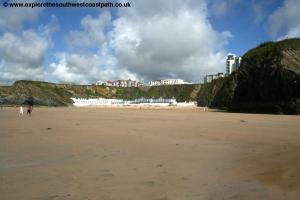 The walk begins from the main car park by the beach at Perranporth which is also where the buses stop. 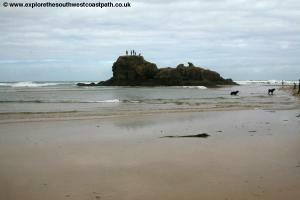 Walk through the car park and at the eastern side of the car park, cross the bridge over a stream and follow the path alongside to cross a second bridge onto the beach. Note that this stream does move when flowing over the beach so the second bridge doesn't always line up with the stream! Continue along the beach passing the Watering Hole, a pub that is on the back of the beach. 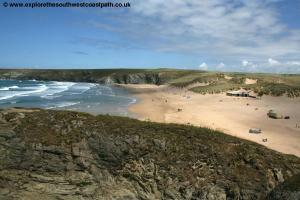 Continue past the second building to the low cliffs at the far end of the beach. Now you have a choice depending on the tide. 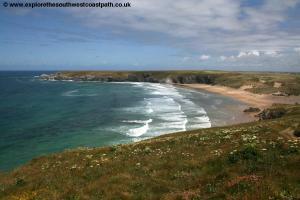 The official route of the coast path climbs up onto the low cliffs at the north edge of the beach and the path then follows the edge of the dunes close to the cliff edge all the way along the beach. 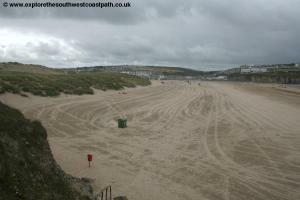 An alternative if the tide is out is to walk the whole way along the beach, using the harder sand near the shoreline. Whichever path you choose there are a couple of access points onto the beach from the coast path if you want to swap between them. 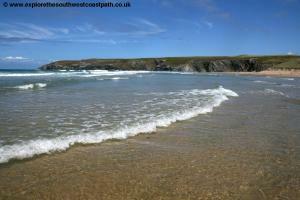 If you follow the beach it's very simple, just keep the sea on your left and keep going to the far end of the beach. 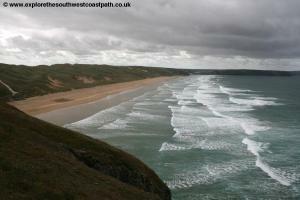 If you are following the coast path take the path up onto the dunes and keep to the main path ahead. It is signed in places with wooden poles marked with yellow acorns. 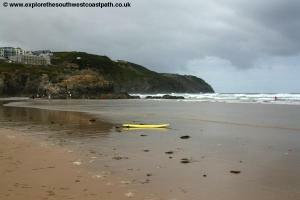 The path keeps to the cliff edge until you reach the surfaced path leading onto the beach from Perran Sands Holiday Park on your right. Here the official route becomes a little harder to follow. You initially follow the main access path ahead but as it turns right to head to the holiday park keep ahead on a smaller path over the dunes. This comes onto a grassy area where you turn a little to the right towards the caravan park where you join another main path going north. This comes to a junction of paths with caravans close by on the right. Here take the path heading exactly due north to another little clearing and take the path ahead. It doesn't really matter if you take the wrong path, just keep to a path that keeps close to the coast. Ahead the paths comes down to a large sandy area. 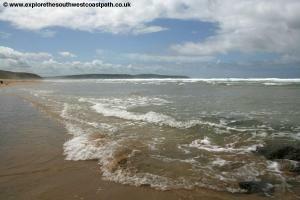 Cross this and head to the back of the sandy area and take the path going north. This is now the main path and easy to follow now we have passed the caravan park. Keep to this until it crosses the access road at the north edge of the beach. Cross this and keep ahead on the narrow path that ahead. 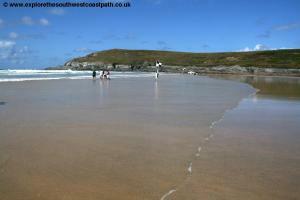 If you followed the beach, on reaching the north end of the beach, take the access road and turn left when signed for the coast path to join the path described above. 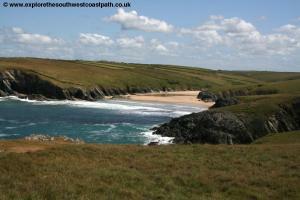 This now follows the cliff top and offers fine views back along Perran Sands. This rounds Ligger Point at the north end of the beach. 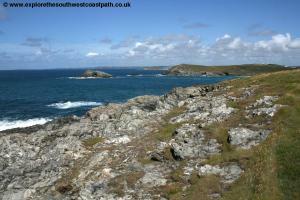 Rounding the headland you pass Hoblyns Cove and continue with the army camp of Penhale Camp on the right. Here you have to follow the path adjacent to the fence on the edge of the camp. The camp looks very dated with old Nissen Huts and the like. As you continue on the path to the next headland you pass all sorts of odd round things on the right, obviously it has some sort of military use but not sure what use. 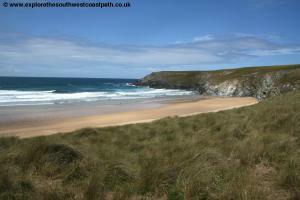 Rounding Penhale Point you have views of another fabulous beach ahead, this time Holywell Bay. 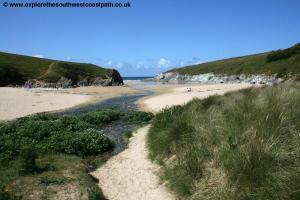 A stream flows out onto the beach here and the coast path follows the cliff top and then heads a little inland to the dunes where there is a bridge over the stream. 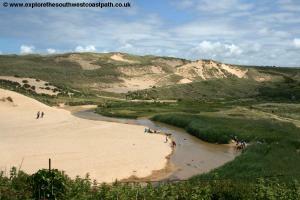 Once over return through the dunes to the beach. The coast path doesn't actually go down to the beach but instead keep close to the edge of the dunes and as they end take the path up onto the low cliffs ahead. The path is now very easy to follow as it sticks right to the coast around Kelsey Head with the rocks of The Chick just off the coast. 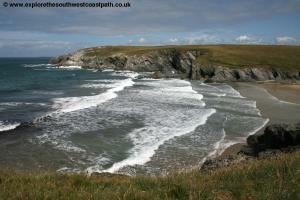 Rounding the headland you come to another fine beach, this time called Porth Joke. Unlike the other beaches in the area with their large car parks this beach is a little more off the beaten track and is usually fairly quiet even in the height of summer and is a good place for a break if the other beaches are packed.The coast path sticks to the cliff top around the back of the beach, crosses a little stream at the back of the beach and then rounds the beach. 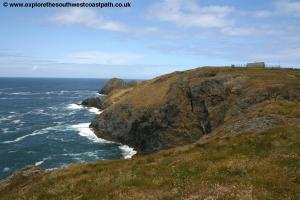 There are several paths here, but turn left keeping to the path closest to the coast. 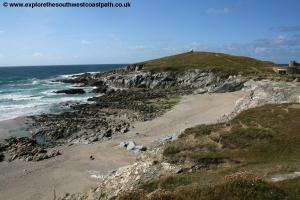 Keep to the main path closest to the coast as you round the next headland, Pentire Point West and now with another glorious beach, Crantock, ahead. 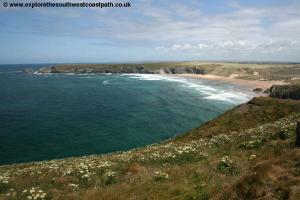 The coast path sticks to the edge of the cliffs until you find yourself descending down into the dunes at the back of the beach. The official route of the path continues through the dunes but it's usually easier to descend down to the beach and walk on the harder sand. 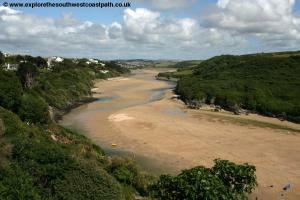 Now the route you can take depends on the tide as you need to cross the Gannel River that flows along the north edge of the beach. 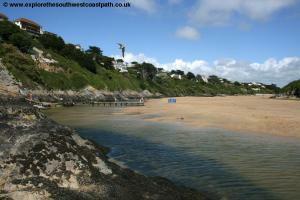 The first crossing point is at the back of the beach just as you come to the mouth of the river. Here there is a bridge that then passes a shop on the opposite bank from where there are steps up to the garden of a tea shop. This bridge is a permissive route and is covered at high tide and is owned by the Fern Pit Cafe. The steps are open when the cafe is open and I believe it is closed during the winer months. An alternative route if the tide is in and the cafe is open is that they usually operat a ferry which will take you across the river for a small charge (currently £1) to the cafe. If the cafe is open and you are able to cross via the bridge or ferry walk past the cafe to come onto the road, Riverside Crescent. 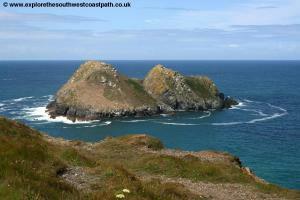 Turn left along the road and follow it as it curves round soon with the main car park at Pentire Point on your left. 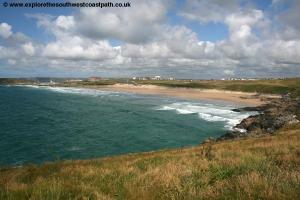 Although not part of the official route, there is a path from the end of this car park that leads right out to the end of Pentire Point which offers lovely views back to Crantock and ahead to Fistral Beach and Newquay. The walk takes around 10 minutes and a similar time coming back. 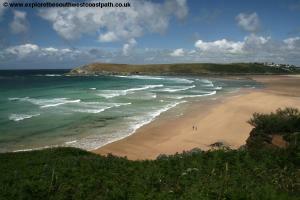 Continue on the road ahead, Esplanade Road which soon passes Fistral Beach on the left. Keep going to the toilet block (beside some on street car parking spaces) and turn left on the path passing the toilets. If you are not able to cross at the Fern Pit Cafe with the cafe and river opposite take the path behind you into the car park and at the end of the car park, turn left along the coast path along the cliff top and follow this along the river estuary, soon turning to the right away from the main river beside a little creek. Keep going to the end of this to a minor road where you cross this creek and then follow the path along the sand on the opposite side heading into the estuary. Here there is another bridge which you may be able to cross although this too is covered at high tide. If you are able to cross you follow the track ahead to emerge into a residential road, Penmere Drive. Turn left at the end of this road and turn left to a T-junction. 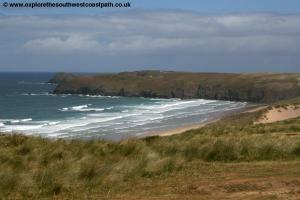 Here you turn right along Pentire Crescent which you follow until it meets Pentire Road, with a golf course ahead. Here you turn left along Esplanade Road where you then take the path beside the public toilets heading down to Fistral Beach to re-join the coast path. If you're unlucky enough that the second bridge is also under water then you now face a little over a 2 mile diversion inland. To take this at the back of the creek follow the track of Penpol Hill to the farm at Little Trevithick. Pass this and continue on the field edge path heading east. This soon comes to Treringey. Keep ahead here keeping the main farm buildings on your right. Keep ahead, crossing a couple of fields boundaries and heading east to reach the road into the village of Trevemper. Turn left on the track between fields heading north and keep to this until you come to the estuary edge. Turn right when you do so to keep to the track over an area of marsh to cross another bridge - this one always being above water. You must now turn left along the main road (Gannel Road), which does have a pavement. Coming to a junction ahead, turn left along Tregunnel Hill. Ignore the residential road (Pengannel Close) on the right) and continue on the road ahead, which now loses it's pavement. The road passes some flats and narrows and soon passes a little car park on the left. As the road starts to climb left up hill, take the path signed off to the left which comes to a residential road (Trevean Way), keep left here behind the houses on a footpath along the edge of the river. This path then joins the route of the second foot crossing over the bridge and you can follow the directions above to come to Esplanade Road. 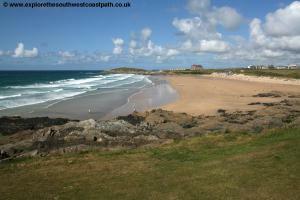 Whichever route you've taken you soon end up on Esplanade Road and take the path by the toilets to Fistral Beach. Now follow this path along the back of the beach. 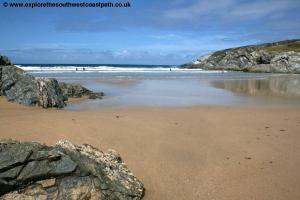 There are regular access points to the beach on the left if you prefer to walk along the sand. Fistral Beach is perhaps the most famous beach in Cornwall as it's famed for it's surf and you'll often see large numbers of surfers on the beach. At the north of the beach the red-brick Headland Hotel dominates the scene. 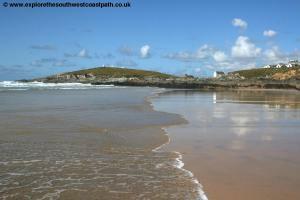 The path soon comes to the main car park at Fistral Beach and you head on the path behind the British Surfing Association building. Take the main lower path around the coast passing the grand Headland Hotel on your right and some holiday cottages beyond. Once past the cottages the path turns right to follow the opposite side of the headland, Towan Head, although there is a path out to the far end of the head which is well worth taking if you have the time. 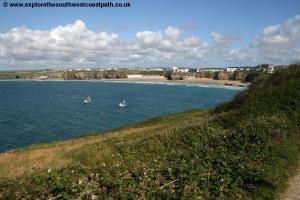 The coast path continues just below the road and you keep the sea to your left with views of Newquay ahead. 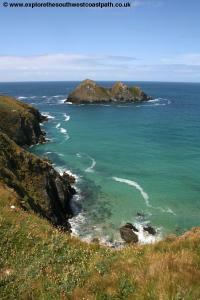 Soon you round the next headland passing the Atlantic Hotel and the white Hewers Hut. Just past the Hewers Hut take the path off to the left heading downhill and soon descending to the harbour wall. Despite it's reputation as a holiday resort Newquay also has a fishing fleet and you'll see the boats lined up in the pretty harbour here. Follow the road along the back of the harbour (North Quay Hill) and take the first road on the left, Fore Street. Ignore South Quay Hill off to the left and continue, past the arcades and pubs on the edge of the town. Pass a car park on the left and continue along Fore Street. This soon comes to Central Square where there are several clubs. Ignore Beach Road off to the left as well and keep on the road ahead until you come to the main pedestrian road on the left. Follow this until you come to the other end, ignoring the road off to the left (The Crescent), continue ahead along Bank Street. Pass Trbarwith Crescent on the left and take the road on the left, passing Fat Willys Surf Shack. 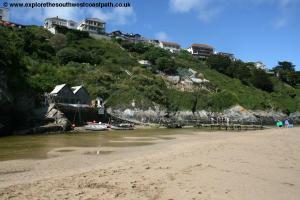 Follow this narrow rode until it soon becomes a promenade above Great Western Beach. Continue along this path until it rejoins the road by the railway station, where the walk ends. Another option is to end at the bus station which is signed from the pedestrian street (Bank Road). To return to Perranporth there is an hourly bus, route 587 operated by Western Greyhound. It takes around 50 minutes for details see the link below. Ordnance Survey Explorer maps 104 (Redruth and St Agnes) and 106 (Newquay and Padstow) cover this area of the coast path and are available from most book shops nationwide and many local shops as well as Amazon. 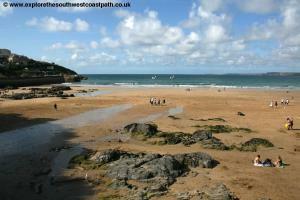 Streetmap is a web site which provides maps of the UK, including the area between Perranporth and Newquay. 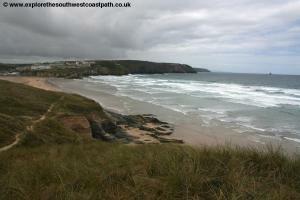 The links below cover the coast between Perranporth and Newquay.